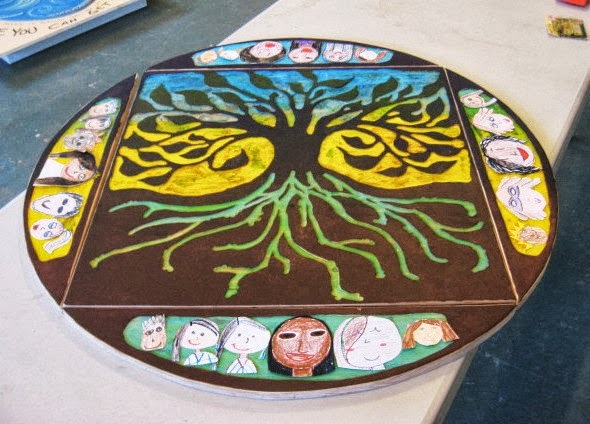 I spoke to Molly by phone yesterday, seeking updates on the schedule for the table project. I knew there was a plan to hold a grand unveiling/reception in our building toward the end of November, but now I learned that we can move them up to the first floor as soon as they are done, for a longer exposure. She figures to finally start pouring the tops next week, so wants me to finish anything dusty by this weekend. Perhaps we'll have some on display by this time next week. Luckily I am nearing the end of my part of this job. At the start of the day there were still two tables that hadn't yet been started, the two tables added to the Asbury music heritage order. 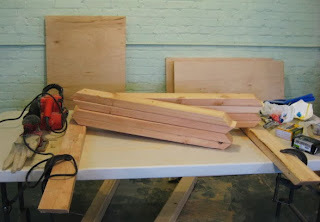 The plywood arrived last week and this week I brought the 2x4's and screws. I could spare two hours today before class, so I got to work. First I cut the eight 30" pieces of wood (above) for the two table frames and sanded what will be the outsides of the frames. 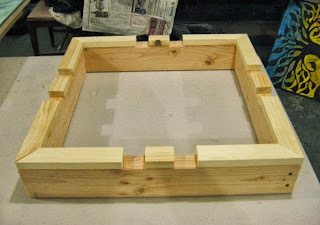 Then I put them together into two four sided frames (below), breaking open a newly purchased box of screws to finish the job. Cleaned up the sawdust and got on my way. 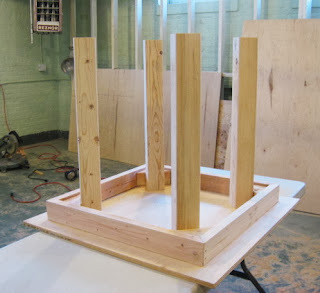 I'll continue the process on Saturday, attaching the square plywood tops to these frames, and finishing the sanding of table legs, three sets to go. Other than making the supports for the folding leaves on the round table (which will have to wait until after it's poured), all that's left is driving screws, which generates almost no sawdust. The latest round of woodcut classes in Belmar continued tonight, but now we have two students. 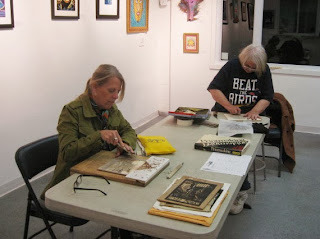 Mary, one of our regulars, returned from a Boston area workshop, ready to make a new print. She had told me that at this workshop she was going to be learning about traditional Japanese woodcut technique, but what she ended up learning about was the Provincetown style of woodcut. 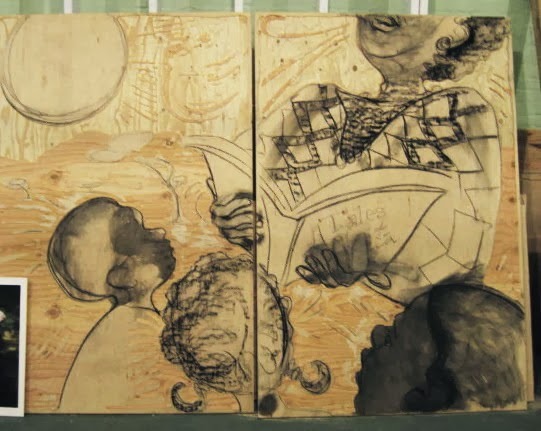 It starts with a white line cutting of a compositional drawing, but instead of removing more wood and leaving shapes of white, the shapes between the lines are individually inked with different colors and printed. The result looks like one of my hand colored prints, except with white lines (un-inked paper) separating the color shapes instead of lines of black ink. I've been familiar with the process for quite a while, but never had the urge to try it myself. Mary forgot to bring with her tonight her piece from workshop, but she started a new one using the same process, so we'll all get to see that soon. The pro-Red Sox t-shirt that Mary is wearing does not necessarily reflect the opinions of the management at Studio Arrabbiata. Tomorrow marks the one year anniversary of Hurricane Sandy's arrival here in New Jersey. It was at 2:00 pm on the 29th that my power went down, and stayed that way for 8 days. It was the largest such storm in history (this country anyway), and though much work has been done up and down the shore to repair and rebuild, the job is not done. Everyone was affected to some extent, and I'm still feeling the effects in a number of ways. 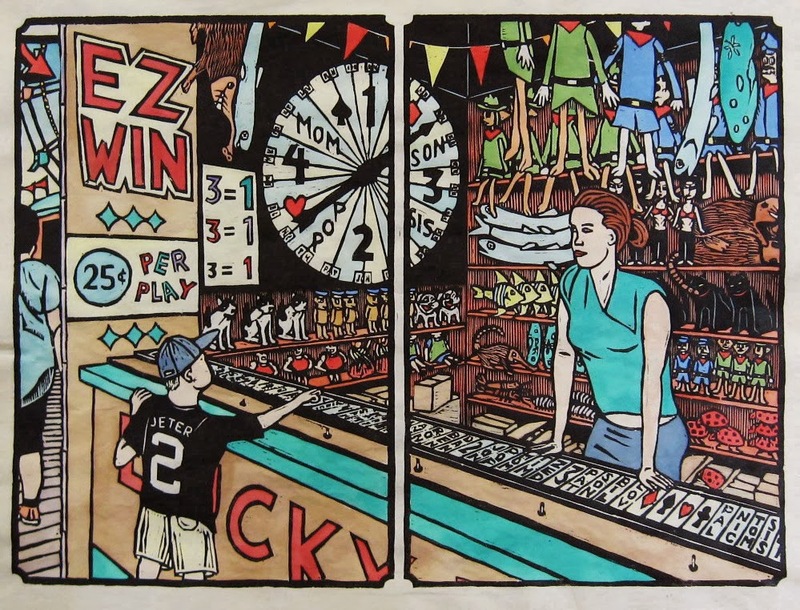 For example, I haven't completed a new print in my boardwalk series in over a year. Not because I can't get there to gather material, but because having to deal with fall out from the storm has taken up what had been art making time. 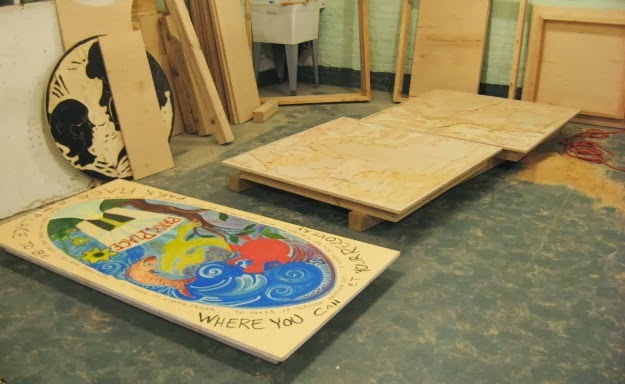 Some of the creative things I've been involved with are related- this table project of the past few months is a post-Sandy community building and healing project, and a saint print I did in the spring was inspired by hurricane relief efforts. One of my goals for 2014 is to get that series going again, finishing the one I have mostly drawn and a few more from the planned list of ideas. However, I got back to my boardwalk prints in a way recently with my involvement in an art show of sorts. A local artist I've known for years (long before this blog existed) talked me into submitting work for the 71st Annual Exhibition of Audubon Artists, an arts group that operates out of the Salmagundi Club in New York. For the moment their headquarters is undergoing renovation, so shows are being done strictly online. I'm not big on the idea of an online show (I have hundreds of works online 365 days of the year), though it does save me from having to transport framed art up to the city. 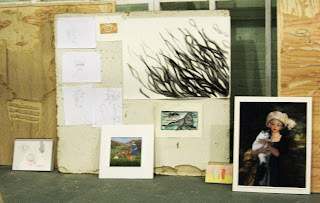 And a bunch of other BAC artists have participated recently, so I sent in an image and a check. 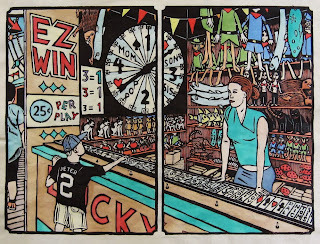 I decided to go with my wheel game image, which won last year's big annual juried show in Belmar, and was recently part of my contribution to the Rahway show this past spring. Work for this show was chosen by jurors for each medium, and so I was in the Graphics category, and knew I was in a few weeks ago. Awards were chosen by outside jurors, two people from the curatorial staff at Boston's Museum of Fine Arts, specifically the prints, drawings, and photography department. Today I got confirmation that I received an award, something called "The Old Print Shop Graphics Award". It doesn't come with a medal like the top awards, but there's a nice check, which comes in very handy right now. Two prizes in two years- I guess I can consider this print a success. Got a long list of morning errands completed in a reasonable time, so I was able to go forward with my plans to shop for table materials in the afternoon. Before taking off I went over my notes one more time, to make sure of exactly what I'd need. My part of this whole project is getting near the end. I have to build two more frames for a pair of tables, each a three foot square, and of course attach them to a plywood top. 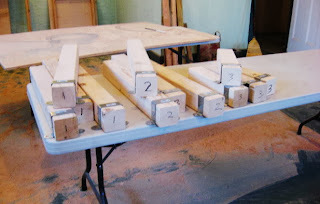 All of the legs have been cut, but three sets still need sanding, which I put off at Molly's request to finish attaching tops to frames, which needs to be done before the surfaces can be poured. 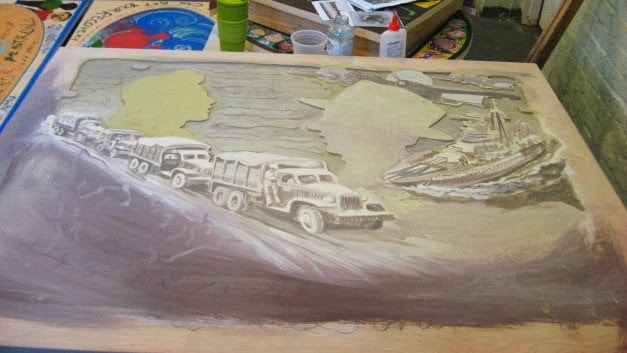 And I'm not going to sand anything right now, both because all the work tables are full and because that dust could be a problem for Molly's poured surfaces. 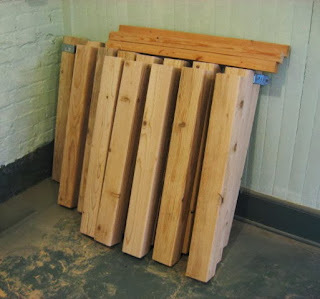 Today's purchases included 2"x4"s for frames, assorted screws, more wood filler, and hinges for the drop leaf table. I'll need to get a few more things, but today's haul will keep me busy for my next bunch of table sessions. My next stop was the Studio, just to drop off the stuff I had bought. Molly was working there over the weekend, continuing the painting of the above piece, which will be low like a coffee table. Since last Saturday a whole lot of military equipment has showed up in the composition (had been just the two heads before), which I believe is part of a Greatest Generation theme. I took a couple of minutes to fill in the recessed screw holes in the table top with some wood filler, which almost completely blended in to the chosen colors, though I expect she'll touch those up as she continues the painting. 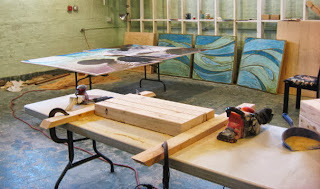 In the afternoon I drove up to the Studio, but not to build any tables. This past week was a busy one in class, with my 2D class printing their woodcut projects, and my Basic Drawing class doing their final charcoal drawings, an individually graded project. 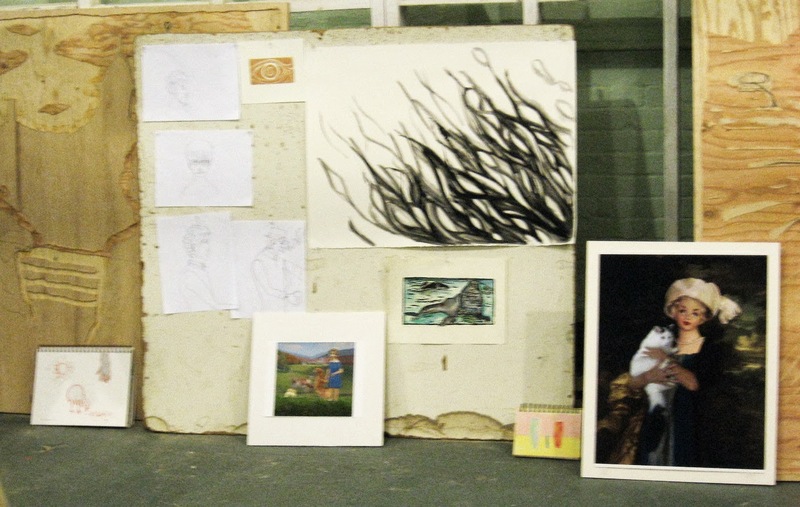 Traditionally I'll document good examples of both of these projects, and this is the best space to do that, with my portable tack board there in the room and a space that can survive the mess of charcoal dust. Took care of all that, but also did some table related work, such as new inventory of my hardware supplies (will be purchasing more bolts, screws, etc this week) and checking Molly's progress on the tables, such as the three above, destined for Jersey Shore Arts Center, also known as our building. I took care of some stuff in the print shop and had just locked up when Molly arrived, so I hung around for a few more minutes. I helped her move some of the completed table tops, which may get poured in the next few days, and we also discussed our planned schedules for the project through the week. I believe she was settling in to do some more work with color when I left and went home. My Belmar based woodcut class was scheduled to start again tonight, and as usual I had no idea who would actually turn up for the class. At least this new Wednesday schedule meant that the office was open during the day, so I could check the online registrations. I had one person tell me she was planning to sign up tonight, and another tell me she would miss the first week but sign up for the session, which makes two, my minimum to run the class. I had hoped that I'd get a walk in or two, but that didn't happen this time. So our first night just had the one paid student, with another expected to join us next week. 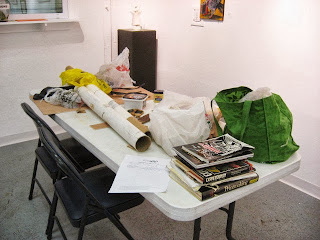 The above photo is from last year, but this is pretty much what things looked like tonight, one very messy table in the front room, while the back room was occupied by the figure drawing group. Maybe next week we'll have something worth showing. 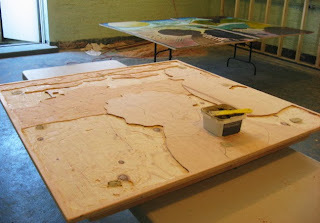 Wednesday is always a table day, so I was back in the Studio by early afternoon. Molly wasn't in yet, but she had someone busy in the process of attaching veneer strips to the edges of all the plywood tabletops, including the one I was there to work on. So while I was waiting, I grabbed a slice across the street, and (after Molly arrived) did a little supplemental coloring to the faces that will be on the leaves of the drop leaf table. Same colors as the kids had given them, just a little denser and darker. Molly continued on that task after I had moved on to finish assembling the table. The 1x2 strips that I had attached along the top of the frame were just glued on, and I figured it wouldn't hurt to supplement that a little, so I drove in some thin nails at key spot around the frame. After that, it was the usual procedure of measuring, clamping, drilling, etc. 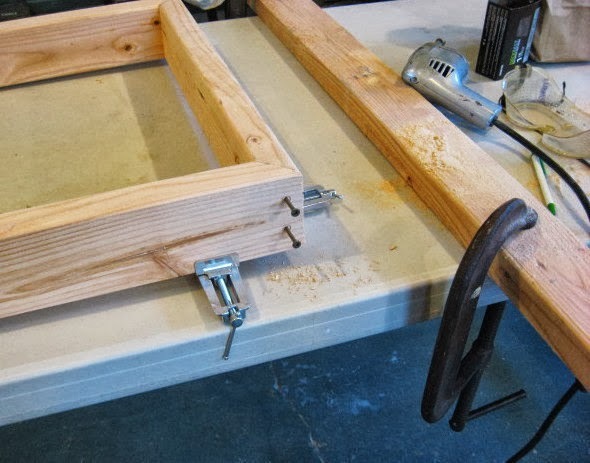 I will say this, it's a lot easier to flip a two square foot table than one that's twenty four square feet. When I was done attaching the top I did make sure that wood pieces would still slide through the holes, though final assembly of the leaf supports will have to wait until the veneer gets trimmed to match the plywood thickness. There are still a few more things I have to do, but most will have to wait until more materials are purchased. 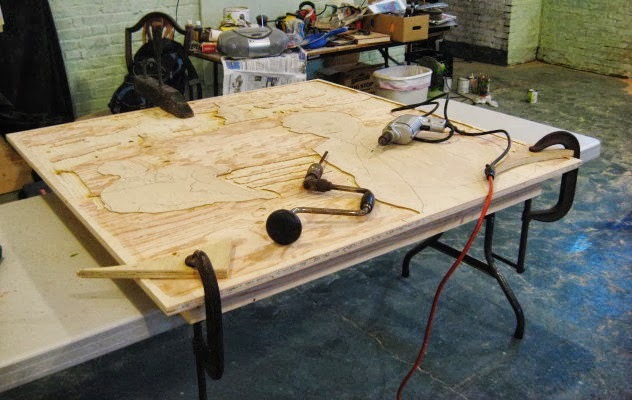 It's Monday, so time to crank up the old table factory again. Molly had stated a plan to start pouring table surfaces as soon as Wednesday, which meant I had some work to get done for today. The agenda included two main jobs- attaching the frames to the tabletops for the two large Boys and Girls Club tables, and attaching the drop leaf table to its frame. The plan called for Molly to provide some help with the former, and since she wouldn't be arriving after 5:00, I started with the other. Actually I started by stopping off for wood first, since I would need to build the frame before I could attach it. And this meant I had to finally commit to how I was going to make this table. This table had been on the list for months, but I hadn't yet settled on how I was going to extend the leaves. This is the smallest table we are making, and I already changed from the standard design plan for this project, with legs only 1/4 the thickness as the other tables, and cutting the setback from the edge to the frame from three inches to just one. This very narrow exterior margin didn't leave a lot of room for whatever mechanism I'd employ. I had given a lot of thought to the problem since the summer, considering spinning, sliding, and hinged support systems. 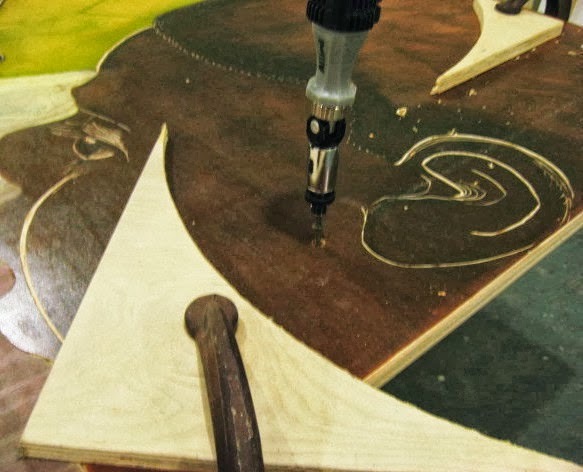 A rotating arm would be easy enough, except that the only place to attach it would be the table top, and with its heavily routed design, I didn't know if I'd be able to use long enough screws everywhere. I decided to go with sliders on all four sides. 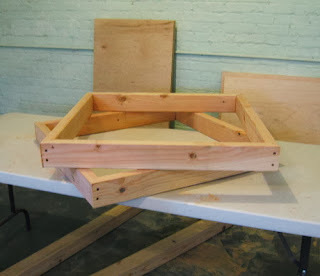 The first step was to build a standard mitered frame (above), like all the other ones I made so far. But this time I added a narrow layer to the top, a 1x2 cut to match the original frame, but with two gaps in the middle of each side. 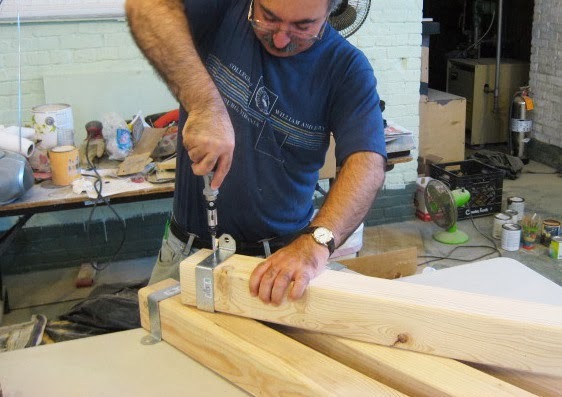 These gaps will eventually hold a sliding mechanism also made from 1x2 wood, and when each is pulled out, it will hold up the leaf by cantilever. However, before I could finish that Molly showed up, and I figured I should get on with the part that she'd be helping with. These are the two biggest tables in the project, each 4 feet by 6 feet, which makes for a very heavy piece of plywood. If I had to I could do this myself, but having a second person would make it go a lot faster, and lessen the risk of of something getting damaged. 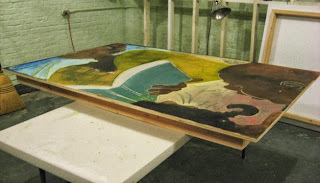 Like the other large tables I've done, I started by placing the frame on top of the table top (carefully, as these tops are already painted), centered it and marked it with masking tape. I put that aside, marked where screws would go, and then drilled pilot holes through the top. Molly and I flipped the top, I applied wood glue to one surface of the frame, then carefully placed it glue side down on the reverse side of the table top, and clamped it in place. Molly was brought in again to help me flip it all back to right side up (she was working on a project out in the hallway). After that it was just a matter of working my way around, carefully clamping each section, then re-drilling and driving in a long screw. Above is the first panel completed this way, along with some of the tools used in this process. 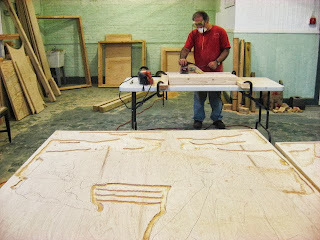 Below are photos of the second panel- driving the last screw, and then the whole thing complete. With that done, I decided to call it a night. I should be able to come in relatively early on Wednesday and finish the construction of the drop leaf table top, at least enough of it to be ready for pouring if Molly gets to it that day. I had a little time to spare in the afternoon today, so I went up to the Studio to pick up where I had left off yesterday with those big square tables for the JSAC. Glued and screwed the last of the three, then applied wood filler to the recessed screw holes on the table surface of all three tables in the set. (those brownish spots seen around the perimeter in the above table) The filler will dry a little lighter, and when I sand it down it will barely be seen (and when Molly paints over it you won't see evidence of the holes at all). 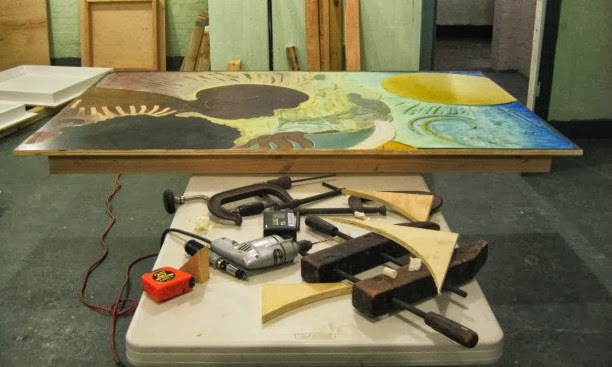 My time there overlapped with Molly, who was continuing the painting of her Boys and Girls club pair of tables, shown in the upper right corner of the above photo. It's hard to get a good shot of them while they are laying down like that, but even here we can see how much they've changed since Molly finished the basic sketch and showed it at the last critique about 10 days ago. 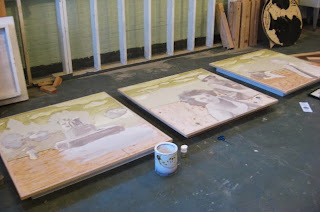 I still have to attach the frames to those tables, but that will wait until Monday, when we'll both be in the Studio again. That will give her more time for painting (and that paint drying), but also that way she can give me a hand with the positioning and flipping as I'm dealing with the frames. The process will be the same as the half dozen I've done already, but these two tables are significantly larger and heavier, more awkward to move by myself. If I can get into the Studio before than, I have other things to keep me busy. Molly had left me a message a night or two ago, asking me to change my plans a little bit. Before she had asked me to concentrate on finishing any tasks that generated a lot of sawdust, so we can get the room cleaned up before she starts pouring the surface resins. But now she wants me to make sure that the frames are attached to all the talbetops berore then, and we'll deal with the other stuff later. I finished two tables in about 2 hours, then cleaned up and left in time to make a delivery on the way home. I moved my two completed tables to the back of the room out of the way. By tomorrow the glue will have dried and they'll be as stable as they ever will be. I'll do the third one in this set on Thursday, back fill the recessed screw holes with wood filler, and turn them over to Molly to finish the tops. This semester Mondays are a table day for me, and today's holiday was no exception. Still working through the sanding of all the table legs, and after today's work, just a dozen left to do. 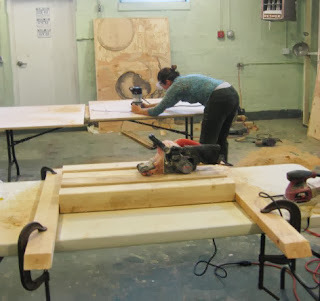 I've shown this step on this blog quite a few times now, but this time you can also enjoy the colorful square tabletops in the background, which we last saw Molly working on this past Saturday. I've been very busy over the past month or so between the table project and teaching and moving, and haven't had a chance to provide an update regarding the train station mural. My last report was around the time of the public showing of the original designs. I heard that a mural committee meeting occurred maybe a week after that, and there may have been more. A few weeks ago I asked if anything had been decided. I was told that I would eventually receive an official letter, but that my design was not chosen. The winner was a professional muralist from Philadelphia (the name was mentioned, but I have forgotten it and it doesn't seem to have been officially announced anywhere yet). So no prize money, but it does spare me from a lot of work that I really don't have time for at the moment. 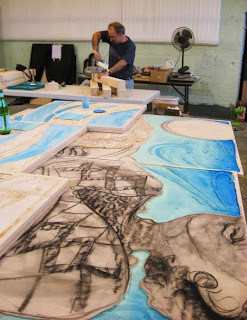 The chosen designer is planning to do the mural in a way that we've seen more and more of lately, painting it on a fabric suitable for outdoors, and then adhering it to the wall, sort of like wallpaper. That will have advantages in this case, as the weather will soon be too cold for outdoor painting, and a busy train station platform might prove to be a tricky place to work. Plus, that grooved plywood wall is not in good shape. 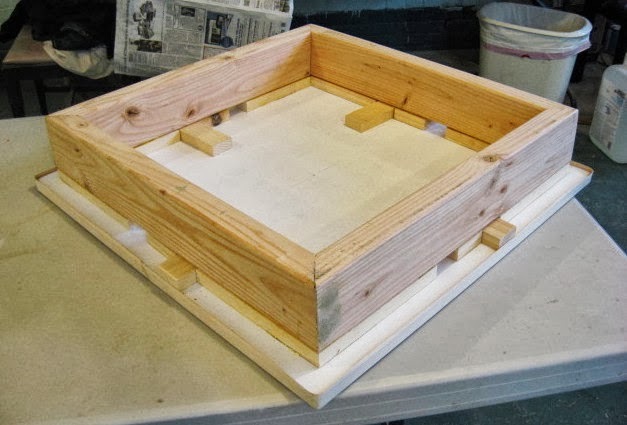 So the new plan is to get new regular half inch plywood, prime it on both sides, then cut it to shape and fit it to the train station exterior. And we got that plan started today. A truckload of plywood was brought to the Boatworks, put up on tables and saw horses, and primed with rollers. I went there to get blog photos, but I also put the camera down and put in time carrying wood and rolling out the primer. How much I end up helping with the mural itself remains to be seen. As I said, I'm incredibly busy these days, and I have much less incentive since they didn't choose my design. We'll see. 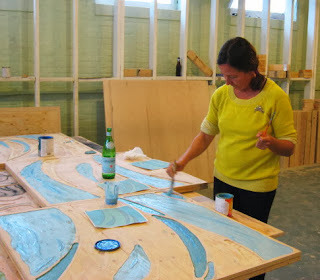 When I arrived at the Studio today I found Molly already in the table shop, doing some last minute sanding and preparing to do some painting on some tabletops. 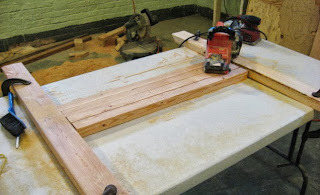 I could have continued my sanding of table legs, but that would create a lot of noise and a bit of dust, both of which would have made it more difficult for Molly's plans. So instead I went with another thing I needed to do, attaching more of the deck ties to the 4x4 legs, while Molly worked on painting. This isn't too difficult. I use one to measure space from the top end of the leg, a second one to mark holes. Quick nail strikes to create pilot holes for the small screws, then three screws to hold the three sided deck tie to the leg. I completed three more sets of legs, bringing the total of completed legs to six tables' worth. That was it for the day, since I was out of the small screws. How soon I continue with this task depends on whether Molly puts them on the next order or just has me buy a box and get reimbursed. I have other things I can do before either option is chosen, so I'm not going to worry about it for a few days. Back to work on tables for a few hours today. Sanded more legs, which I've shown a lot, but this time I sanded those skinny legs for the drop leaf table, each about 2" x 2". Below is the set of sanded and finished legs so far (except for the short coffee table legs, currently stored in another part of the room. Before leaving I put together a definitive list of the rest of the materials we will need to purchase in order to make all the requested tables. I'm hoping that Molly acts on it soon, but I have several hours of work left that I can do with the materials we have in stock. As much fun as the tables are, sometimes I do need to work on other projects. Yesterday was my long day of teaching, and today I had to devote time to getting ready for my Thursday 2D class. 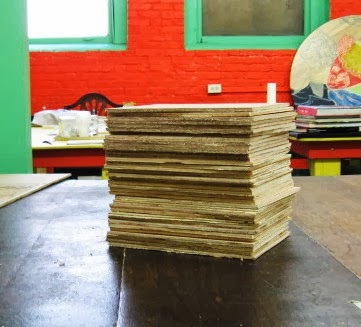 That class always does a woodcut, which means the students need wood to work with. So that means my tradition of going out and getting a board and cutting it up into small pieces. Only one 2D class this semester, so one 2'x4' panel was enough. The above photo is old, but this process hasn't changed over the years. I expect that I'll be back up there tomorrow, but it will be table time again. Every month I send out e-mail reminders to a list of regulars in our critique group, and Molly sends out texts to a similar group, with some names shared between us. I did that for this month, and got one yes, two probably, two maybe, and a whole bunch of no, but probably next month. Molly had heard back even less than I did, so we were thinking a small crowd and a quick night. But when Molly arrived for the event, she saw a large group of people, most with work. Above is the initial set. Clockwise from the upper left corner: a group of line drawings from first time participant Ben (friend of Tim), a small freehanded woodcut from Mary L, an ink drawing from Mary G, a digital collage from Jill, small pastel drawing from Mary G, a hand colored woodcut from Harriet, a mixed media collage from Jill, and a drawing from Tim. Lisa brought in three new sculptures. 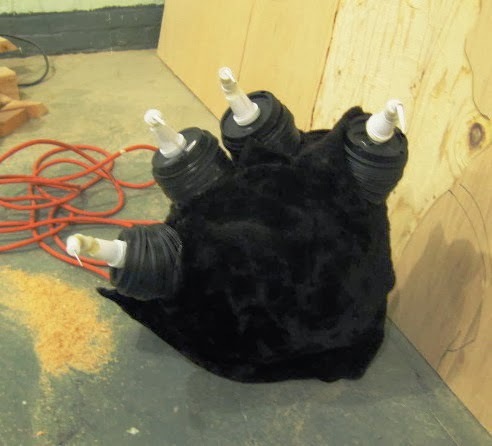 The clear favorite was this giant cat's paw (or bear's paw, depending on how you see it), which was both scary and cuddly, with it unusual (for her) use of a furry cloth. Of course, Molly's tables line the whole room, but she was featuring the Boys and Girls club diptych. Many praised the drawing on the figures, especially the three children in the foreground. Since the one in the lower right corner is based on a photo she took of me, I'm going to claim a tiny bit of credit. 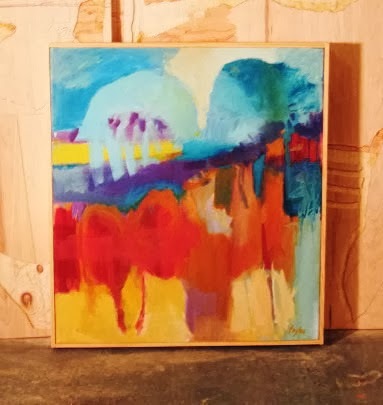 Our last artist of the night was Sandy, who brought a recent painting, taking advantage of inexpensive color samples of latex paint from the local home improvement store to go wild. She advises everyone else to do the same. After a typical Monday morning, hours spent moving furniture and heavy boxes out of one apartment, and up a flight of stairs to another, I was able to work my way up to the Studio and get back to work on the tables. About halfway through my planned work for the day Molly arrived, also ready to work. Two work tables, two extension cords, two pair of goggles, two dust masks, lots of ear plugs. And when we were done, a lot of sweeping. Above, Molly uses her router to do some rough carving of two of the tables destined for our own building. Below, I complete the sanding of another two sets of table legs. And we're both just a little further along on this big project. Haven't seen Molly for a few days, so I don't know what the timetables are for some of the tables. I do know that I had sanded the legs for the first three that she had me assemble tops and frames, so I decided to take a little time to work on those twelve legs. 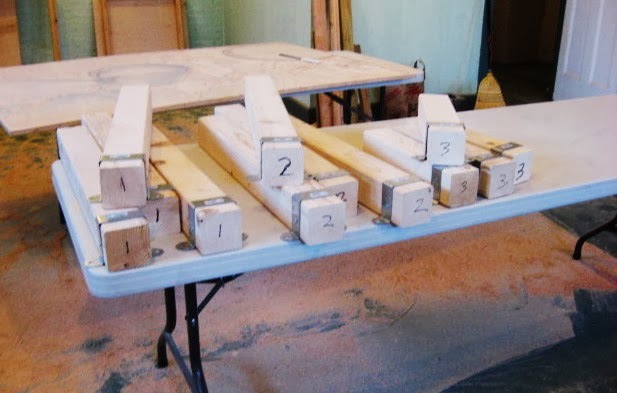 For each table I assembled the four, measuring the location for the deck tie, and attaching it with three small screws. I also went ahead and numbered each set, which will be important when it's time for final assembly. 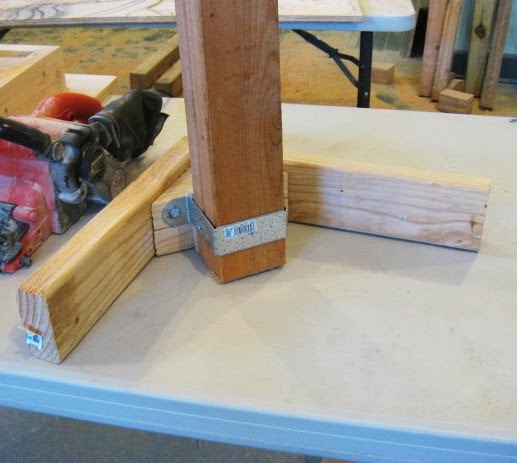 There will likely be slight variations in each corner mount, and this is part of the plan to make sure each leg goes to the corner and table it was measured for. With those done, I put everything away, took a walk up to the beach to gather some things I can use for class this week, then headed home. I wasn't home for very long when I got back in the car and drove to Belmar to see the new Masquerade show at the Boatworks. I participate in a lot of shows there, but I had nothing in stock that fit the theme, and definitely no time these days to create something new for the occasion. 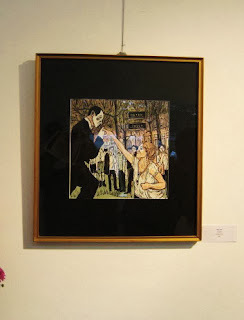 However, woodcut was represented. Mary Lane, friend of the Studio for both my woodcut class and our monthly critique, submitted a color woodcut to the show of art inspired by the mystery of the mask. I'm happy for her to be in this show, which turned out to be better than I expected, and it can't hurt in promoting my upcoming woodcut class. The Masquerade show is on display Wed to Sunday, 1 to 5 pm, through Novmeber 8th. I had about an hour to spend at the Studio today. Not really enough time to do a big batch of sanding, but I decided to put the table I assembled the other day up on a work table and sand the underside of the frame. That didn't take long, so I moved on to some experiments with the legs. I took four of the finished legs, four of my corner wedges, and positioned them on the inverted tabletop (above). Later I put a narrow scrap across the tops of those legs and checked if for level, and in each case it matched exactly what I found in the table top (the work table itself isn's perfectly level), so these should work well. Not ready to actually attach the legs yet (Molly would prefer to deliver the tables without them, figuring it will be easier to find transportation for unassembled tables, and that is probably true) but I wanted to play around with my plan a bit. So I got out one of the prototype leg corners I had made months ago, and made some adjustments. I wanted to see if it would work if I moved the deck tie a little further down the leg (or up in the inverted prototype), providing a little more space for hands to work. The width of the deck tie strip is pretty much the same as the thickness of a 2x4, so it was easy to measure where to put the deck tie and have it go through solid wood in the corner wedge and then the frame. This will likely be the plan when I start making leg units in the near future.